Sefton CVS are pleased to announce the next Meet The Funder event will take place onTuesday 26th March with BBC Children In Need, 10am-12noon at the Sefton CVS Offices. 2019 is Sefton’s Year of Friendship! Sefton Council is delighted to celebrate the official launch of Sefton’s Year of Friendship 2019. A recent launch event was held at Waterloo Community Centre highlighted the positive impact friendships have on peoples’ lives. Over recent years there has been an increase in loneliness within certain groups across Sefton, which has a detrimental impact on health and well-being. Sefton Carers Centre is a dynamic, local charity providing an extensive range of services to unpaid carers in Sefton. We also provide support services to Direct Payment clients in Sefton. Our vision is a world in which the role and contribution of unpaid carers is recognised and valued and where they have access to support and services of the quality that they need to live their own lives. We currently have an exciting opportunity to join our Senior Management Team and help drive the quality and impact of the services we provide to unpaid carers and direct payment clients in Sefton. The role is offered on a permanent basis. Sefton CVS in partnership with South Sefton CCG and Southport and Formby CCG will deliver a pilot project working directly with Sefton residents who are using urgent care services inappropriately. This role is fixed term for 18 months. The post holder will manage a team of ‘Outreach and Intervention Workers’ who will work with ‘high intensity users’ to reduce the number of emergency ambulance calls and unscheduled care interactions. The ‘Outreach and Intervention Workers’ will focus on positive behaviour change addressing those issues that are contributing to residents utilising care services inappropriately. The post holder will also manage a team of ‘Reablement Health and Wellbeing Trainers’ working as part of the ‘Virtual Ward’.. The focus of reablement is on helping older people “to do for themselves” in their own home rather than “doing it for” them. Reablement is about supporting adults to achieve maximum independence and regain the skills and confidence they may have lost as a result of poor health or as a consequence of having spent a period of time in hospital. The closing date for completed applications is 5pm on Monday 17th September 2018. Interviews are scheduled for Wednesday 26th and Thursday 27th September 2018. Please note: candidates must be available to attend interview. All completed applications and for any enquiries, please email recruitment@seftoncvs.org.uk. Community groups in Sefton which work to divert young people away from crime and anti-social behaviour are being invited to bid for grants for projects running during the autumn half-term, thanks to Merseyside’s Police Commissioner. Jane Kennedy has announced that she is once again releasing a round of funding from the Police Property Act Fund (PPA), which allows money raised from the sale of unclaimed stolen goods or property recovered by the police to be used for good causes. It is the ninth time the Commissioner has asked community organisations, charities and groups to apply for a vital cash boost of up to £5,000 grants for grassroots initiatives which are working to help young people to make the right choices. A total of £45,000 is available from the fund for one-off grants for organisations which are committed to improving community safety, reducing crime or supporting victims. The Commissioner said: “I am pleased to once again open up the Police Property Act Fund for bids of up to £5,000 to organisations which are working to make their communities safer and better places to live by engaging with young people. All applications must be submitted online via the Community Foundation for Merseyside by 5pm on Monday 14th September. Please visit their website http://www.cfmerseyside.org.uk/funds/police-property-act-fund to apply. Do you have some spare time on your hands during the school holidays or any evenings or weekends free? Would you be interested in helping disabled youngsters have fun in inclusive settings across Sefton? If so you could really make a difference to peoples’ lives. As part of Sefton Council’s Year of the Volunteer campaign, we are encouraging residents to consider volunteering for Aiming High. This is a very important service which gives support to children and young people with disabilities and their families. All year round the dedicated team provide specially tailored sessions which young people can access. This includes sport activities, outside play, music, dance and so much more! As we approach the school summer holidays, Aiming High are looking for more volunteer helpers for their summer programme which is packed full of fun and engaging things to do. This will be a great experience for anyone who wants to join in and have some fun with amazing young people and staff. It’s also an excellent opportunity for school leavers or students who want to work in a similar field such as social care, teaching or as a sports instructor. Check out our featured video below with the Aiming High team. We caught up with Laura Cunningham who has been one of our amazing volunteers. She helps out twice a week in our after school club for children with severe learning difficulties. She has now gained employment with Aiming High for the summer programme. Sefton’s Public Health Annual Report Now Available! Sefton’s Director of Public Health, Matthew Ashton, is delighted to release this year’s Public Health Annual Report (PHAR) which focus’s on children and young people growing up healthy and happy. Presented for the first time in video format, the report explores how children and young people from across the borough approach mental health and wellbeing. Using real-life stories, the film looks at how young people deal with issues such as exams stress, anxiety, worry and looks at the support available throughout Sefton. In addition to the video, please click here to download the report (PDF) and please visit www.sefton.gov.uk/PHAR for more information. Southport is set to host the latest in a series of small outdoor culture festivals appearing across the Liverpool City Region. Grass-roots, multi-arts festival Threshold have teamed up with Independents Biennial and The Atkinson, Southport to deliver a free, family friendly outdoor mini-festival on Saturday 28th July, coinciding with the launch of Sefton Open 2018. Location: The Atkinson, Lord Street, Southport, PR8 1DB. The event is one of the Independents Biennial’s five special commissions taking place during the visual arts festival, which runs until October 28 in Liverpool, Sefton, Knowsley, Wirral and St Helens. The sister festival to Liverpool Biennial, it champions and supports emerging and grassroots art and artists on Merseyside. The day of events by Threshold, including a mix of visual arts, performance, storytelling and music, will take place at the renowned Atkinson arts centre from 11am – 3pm. Interactive performance and theatre shows from ‘Funny Looking Kids: Comedy Club’ and Storytelling from the magically talented Gav Cross. A visual arts programme including interactive live sculptural and drawing workshops, using live performances on the day for inspiration from: Pamela Sullivan (creator of detailed and fascinating installations); and Jazamin Sinclair (creator of satirical acerbic storyboard illustration series Illustrated Prosody). Music entertainment will come from: ‘Operation Lightfoot’, a music and arts collaboration directed by composer Luke Moore; stand-out, powerful country rock & roll from Amber Stone; and folk-punk sounds with biting lyrics & harmonies from Jazamin Sinclair. “Threshold has grown up in the creative boom of Liverpool’s Baltic Triangle as a multi-arts festival, which is fiercely independent and inclusive-roots. We deliver quality above all from grass-roots, brilliantly talented artists.” Chris Herstad Carney, Threshold Festival Director. “Working with Independents Biennial and The Atkinson is really close to our hearts. The main focus of the day, as with all Threshold events is to enrich people through art and music, but most importantly for it to be a fun experience for all!” Jazamin Sinclair, Threshold Festival Visual Arts Curator. Whether you’re a novice or a veritable Vincent van Gogh, sketching outdoors is a fun, relaxing way to spend time with others. The North End Sketch club in Liverpool’s Stanley Park is branching out from its artistic roots and going on tour, as organiser and artist Jayne Lawless teams up with the Human Library in Bootle to take participants to parks and green spaces across Bootle. The North End Sketch Club takes place every Friday, 11am until August 10. Everyone and anyone is welcome, just turn up to Bootle Library on the day. Find out more about the Human Library Facebook page. Members of the public who’re interested in learning more about health commissioning across Sefton can attend the latest governing body meetings. NHS South Sefton Clinical Commissioning Group (CCG) and NHS Southport and Formby CCG are holding their next meetings in July, with doctors, nurses and other health professionals discussing the performance of local health services, such as hospitals and community care. NHS Southport and Formby CCG will hold its meeting on Wednesday 4 July with NHS South Sefton CCG’s meeting taking place the following day on Thursday 5 July. Dr Craig Gillespie, local GP and NHS South Sefton CCG interim chair, said: “For the governing body it’s important that the public are always part of the decisions we make, this is why it’s great to see local people in attendance. 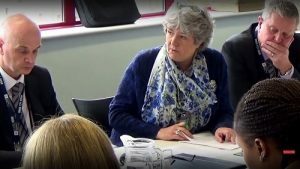 A local GP is returning to the NHS Southport and Formby CCG governing body for her meeting as the new clinical lead for planned care. Formby GP Dr Emily Ball has lived in the town since 2004, after growing up in Crosby and training in Nottingham. NHS Southport and Formby Clinical Commissioning Group (CCG) and NHS South Sefton CCG say they’re proud to have been finalists in the prestigious HSJ Value Awards 2018, recognising the best efficiency and improvement across the NHS. Together, the CCGs were awarded the title of highly commended in the communications category for their work associated with communicating their Repeat Prescription Ordering Scheme (RPOS) at the national ceremony in Manchester. RPOS was designed to significantly improve medicines safety for some of the borough’s most vulnerable residents, by reducing the amount of wasted and unused drugs stored, without supervision, in their homes. At the same time, the scheme aimed to reduce the high cost of these wasted medicines, achieving at least £500,000 savings in its first year of operation. The CCGs worked one-to-one with vulnerable patients, created short videos and also toured Sefton to help explain the scheme by explaining the risks caused by stockpiling drugs at home, and helping patients to have medications reviewed regularly to fit their needs. Susanne Lynch, head of medicines management at the CCGs, said: “It was a real honour to be at the awards ceremony and to be judged the only highly commended scheme in the communications category. We’re really proud of the work we have done to be shortlisted. Lyn Cooke, head of communications and engagement at the CCGs, added: “It was essential for the communications and engagement team to be involved from the inception of the pilot and its initial design, through to its evaluation and wider roll out to the rest of Sefton. “Through working closely with the medicines management team, we maximised on their expertise as pharmacists and pharmacy technicians to speak to people about their medicines and to ensure that the repeat prescription ordering scheme would work for them. Alastair McLellan, Editor, HSJ, said “In July the prime minister has promised to reveal a historic funding settlement for the NHS. However, this welcome and long overdue boost will not remove the need for the NHS to deliver high quality healthcare which is also value for the money spent on it. Indeed, the extra money is likely to come with even greater scrutiny on NHS efficiency. NHS Southport and Formby CCG and NHS South Sefton CCG were one of nine organisations shortlisted in the communications category of the HSJ Value Awards 2018, with local specialist mental health, addiction, learning disability and community health services provider Mersey Care NHS Foundation Trust. The Community Business Bright Ideas Fund will reopen on 26th June 2018 at 10am and close on 31st July at midnight. The Community Business Bright Ideas Fund aims to give community groups in England the support to start setting up their community business. Groups accepted onto the programme will receive one to one business development support and be invited to apply for a small grant to fund development and start-up costs, such as feasibility studies, legal and other fees connected with developing governance, taking ownership of a building or other asset, community engagement, business planning and more. Interested community groups can already read the guidance and register for the ‘Is Bright Ideas right for you?’ webinar on 18 June. The Atkinson Development Trust is a charity run by a small, committed group of skilled volunteers who have a shared love of Sefton and The Atkinson. Established in 2015, we’re still growing and developing. Our aim, in short, is to raise money. What interests us is what we can do with the funds we raise. We all believe in the transformative power of art. And we believe that communities thrive best when they have civic pride and a sense of place. So, the Trust was established to work in partnership with The Atkinson to use its collections to make a positive impact on local people’s lives. Govern i.e directing and controlling the organisation through collective decision-making. This is a mandatory requirement of every Trustee. Living Well Sefton partners are offering a host of activities to appeal to men during this week’s Men’s Health Week. This year’s event has a focus on men and diabetes and all the activities aim to encourage men to look at what they eat and how they keep active. In the south, Netherton Feelgood Factory and May Logan Living Well Centre in Bootle, have a timetable with the following for men to choose from: walking groups, craft and arts groups, yoga, gardening clubs and an informal mental health drop-in. On Thursday (14th) at the May Logan in Knowsley Road there is a men’s sports group. Drop in from 1.30pm to relive your favourite memories from the world of sport. While on Friday (15th) the Feelgood Factory has a man’s social club. For £1 you can enter the Man Cave from 1.30pm. While in Southport, Brighter Living Partnership’s men’s group has lined up a week of taster sessions. For those who try out the taster sessions and become a part of the men’s group there is also the chance to undertake training with the goal of becoming peer mentors. Sefton Council has received initial National Lottery support for the Southport Townscape Heritage Project. The Council managed to beat off fierce competition from 23 other submitted bids nationally to be one of only 5 areas within the UK awarded the grant. • Increase the levels of economic activity within the target area to reduce the number of vacant and underused properties. The project will focus on historic properties between Lord Street and the Promenade in order to complement the previously awarded Heritage Lottery Funded restoration of Kings Gardens and the recent £2m award from the Coastal Community funds for the pier. Development funding of £70,100 has been awarded by the Heritage Lottery Fund (HLF) to help Sefton in partnership with Southport BID progress their plans to apply for a full National Lottery grant of £1.6m at a later date, which it is hoped will contribute to a combined funding pot of around £2.4m. The project aims to carry out essential conservation work, involving structural and external repair of historic buildings; the reinstatement of authentic architectural features (e.g. traditional shopfronts, windows) and works to bring vacant floor space in historic buildings back into use. The project will also bring community and educational benefits to the town and in conjunction with partners such as Southport Civic Society and education and training providers, will include a programme for promoting the heritage of the town including education, training and skills development for the repair and looking after historic buildings. It is hoped that this will bring about significant volunteer opportunities. The target area for the project is located within Lord Street and the Promenade Conservation Areas which includes a rich and nationally significant collection of historic buildings, layout and landscaping. This heritage is important to residents, businesses and visitors alike, contributes to the economy of the town as well as giving a strong sense of identity, local pride and community value. Cllr Daren Veidman, Sefton Council’s Cabinet Member Planning and Building Control, said: “Considering we were competing against other local authorities for this funding and how massively oversubscribed it is, the fact we are successful is a testament to the strength of our bid. “This was a real team effort and involved a lot of hard work with our planning and conservation officers along with partners. “The project will focus on the areas between Lord Street and the Promenade linking up the town centre with the seafront to build on the recent Heritage Lottery Funded restoration of King’s Gardens and the Coastal Communities Fund of £2m for Southport Pier. Rob Uffendell, Chair of Southport Business Improvement District, said: “This is a great example of an effective and strong public and private sector partnership working together to attract external funding to Southport. “BIDs aren’t just about delivering events and organising marketing and promotional campaigns. There is increasing evidence that investors and funding bodies are becoming more attracted to areas where BIDs operate and that has to be good news for the future development of our town”. Southport Townscape Heritage Project has initially been granted round one development funding of £70,100 by the Heritage Lottery Fund, allowing it to progress with its plans. Detailed proposals are then considered by HLF at second round, where a final decision is made on the full funding award of £1,625,000. Southport Food & Drink Festival 2018 starts TODAY! Thousands of culinary explorers are expected to attend the free, three day, annual Southport Food and Drink festival this weekend. The superb setting of Victoria Park, Southport will host the Sefton Council run festival of fabulous fare and delicious drinks between Friday and Sunday (June 1st-3rd). Street food stalls serving a variety of international flavours and healthy treats will be tantalising tastebuds throughout the three days. Foods on offer include crepes, gourmet burgers, hot wings, churros, spiral potatoes, paella and curry, to name just a few of the culinary delights visitors can enjoy. Cllr Marion Atkinson, Sefton Council’s Labour Cabinet Member for Regeneration and Skills, said: “Southport Food & Drink Festival is a fabulous event for all the family, with plenty of entertainment taking place alongside a vast international array of food and drink. “The festival gets bigger and better every year and we look forward to welcoming people of all ages to this superb free event. A huge variety of food and drink producers from the region will also set up shop in Victoria Park, showcasing the very best creations imaginable; from Posh Pots to Retro Shots, herbs and spices, to pies and puddings. The atmosphere is brought alive with live music throughout the day, including a children’s festival where circus workshops, food themed activities and more to keep little ones will be entertained all day long. Southport Food and Drink Festival runs from 10am-6pm between Friday June 1st and Sunday June 3rd. Plaza Cinema has been showing a selection of specially chosen films this year to help celebrate its 20th birthday – but next month will be extra special as the screenwriter of the chosen film will be one of the guests and will even hold a question and answer session afterwards! The community venue turns 20 in July and manager Martin Fol is showing 20 films across 2017 to help celebrate. On Sunday, June 11th, at 8pm, the Plaza will show 2004 comedy-drama film Millions, with screenwriter Frank Cottrell Boyce scheduled to attend and answer questions from fans. The writer, who lives in Blundellsands, created the screenplay for the film while it was actually being made by adapting his previously published book of the same name. The novel Millions was subsequently awarded the Carnegie Medal, which is a British literary award that annually recognises one outstanding new book for children or young adults. The Plaza Cinema officially turns 20 on Tuesday, July 18th and more details on event plans will be revealed closer to the time. A group of fundraisers led by a Formby cancer hero are looking for local people to pledge their support and help them raise money for life-saving cancer research. Each year around 148 people in the Sefton region will be diagnosed with cancer and one in three of those will die from cancer or cancer related diseases. The Sefton-based fundraising group for the charity North West Cancer Research is now looking for volunteers to act as regional cancer heroes and raise money for cancer research. Jim Brown, 72, from Formby, set up the group earlier this year after working with local cancer support group The Daisy Chain. Wanting to widen his support for cancer-based charities, he set up the fundraising group with his two friends Kevin Dunne and Hilda Boyd. Jim who has lived in Formby all his life, was first inspired to work with local cancer charities after his wife Joan was diagnosed with breast cancer five years ago. He said: “When we got Joan’s cancer diagnosis, it was a shock for us all. But thanks to treatment, which included surgery, chemotherapy and radiotherapy, she’s now doing much better. “Watching her go through her treatment was hard, but she has been so brave throughout it all. It was then that I knew I wanted to do something to help others and offer support for them and their loved ones. “Research is an incredibly important part of the cancer journey. It’s more than just finding a cure for cancer, but it’s also about developing treatments which not only kill cancer but are easier for patients to cope with and do not have the horrendous side-effects that many treatments do today. The group is inviting volunteers to join them as they help raise money for this life-saving cancer research. They are looking for people to help organise fundraising events in the local community. To find out more contact Jim on brownchest@yahoo.co.uk or call 01704 574787. Tickets are now on sale for the upcoming Formby Festival. Organisers of the three day event, which aims to celebrate the best in entertainment, food and drink say they are planning a festival which will be bigger and better than ever before. Between July 20th and July 22nd, hundreds of people are expected to descend on Formby Village centre for the festival, with special tribute nights planned to honour both Robbie Williams and Cilla Black on the Friday evening (July 20th). A spokesperson for the Formby Festival said: “With cuisines and delights from across the globe there’s something to satisfy each person’s taste. “Are you an artisan enthusiast? With home-made gifts, specialist snacks and much more you won’t be disappointed! “We have chef demos throughout the Saturday and Sunday with our resident celebrity BBC Fusion Chef of the Year; Aazam Ahmed with guest chefs as well. Our main stage is jam packed with the finest talent the UK has to offer. “From Friday night right through to Sunday evening you’ll hear local bands, choral groups and even see performances from TV stars! “Every year we aim to make Formby Festival even better than the last. We’re excited to announce that we’ll be having a tribute night on Friday. “This will be a must-see, so make sure you’ve got your tickets. For more info visit www.formbyfestival.co.uk. Volunteer Centre Sefton will be holding a Volunteer Fair at the Atkinson on Lord Street in the town from 11am until 3pm on Tuesday 6th June, as part of Sefton Council’s 2018 Sefton’s Year of the Volunteer initiative. Volunteer Centre Sefton – which is part of Sefton CVS – has more than 40 years’ experience of helping local people to find the right volunteering roles, as well as offering advice to organisations who are looking to recruit volunteers. Information on a wide range of opportunities will be available at the Volunteer Fair, from groups seeking green-fingered residents for gardening projects to organisations looking for people who can support families in crisis or ex-offenders. Organisations attending the event will include the Friends of Kings Gardens, literacy charity Beanstalk, Leonard Cheshire Disability, Southport FC, the Orrell Trust and Sefton Community Learning Service. Representatives will also be attending from Citizens Advice Sefton, Parenting 2000, Home-Start Southport and Formby and Merseyside Offender Mentoring. Mike Howlett, Volunteer Centre Sefton’s Senior Citizenship and Volunteering Officer, said: “At this event we’ll be looking for people to join our existing volunteers in the borough who do such a fantastic job in terms of helping to improve the lives of thousands of local people. “As well as being a good way to meet new people, volunteering can be tailored to the lifestyle of each individual – what you do, where you do it and how much time you give is totally up to you. Anyone unable to attend the event who would like information about the opportunities on offer can get in touch with Volunteer Centre Sefton on 0151 920 0726 or email info@volunteeringsefton.org.uk. Commitment: Board meetings 4 times a year held in Liverpool during business hours plus participation on one or more of our sub-committees (Grants, Investments, Finance, Risk Management) and occasional visits to Merseyside charities. A brief covering letter outlining why you would like to be a PH Holt Foundation Board Member and the skills you would bring to the role [maximum two sides of A4]. Deadline: 9am on Friday 15th June 2018. Local health commissioners are encouraging Sefton residents to examine their options if they become unwell over the bank holiday weekend. Anyone who thinks they may need to access health services over the bank holiday is being urged to check opening times for walk in centres, GP practices and chemists and also think about ordering any repeat prescriptions they need before the long weekend begins. The local NHS in Sefton is also reminding people that A&E and 999 services are for life-threatening and serious conditions. Across the region there are a range of health services to support people if they feel unwell or have any health concerns. There are services which you may be unfamiliar with, but could be more appropriate and convenient for you depending on your specific issue. Many pharmacies will be open throughout the bank holiday weekend and the best way to find out which pharmacy is open and when is to visit our ‘Your Services Health page’. Your local pharmacy can offer free, confidential and expert advice on a range of health issues. They can also help you to self-care and prepare for many common illnesses and offer advice on which medicines to keep in stock at home. In Sefton – whilst all pharmacies provide advice and treatment for a range of minor illnesses and ailments, a number in Sefton offer Care at the Chemist, which ensures our most vulnerable patients who don’t routinely pay for their prescriptions have free and easy access to over the counter medicines they may need without the need to see a doctor. You can find a wealth of trusted advice about hundreds of health conditions and details of GPs, pharmacies in your local area by visiting www.nhs.uk. This useful website also includes a handy symptom checker. When you need medical help or advice fast, but it is not a 999 emergency, you can also call the NHS 111 service. NHS 111 is available 24 hours a day, 365 days a year and calls are free from mobiles and landlines. If you need medical care for illnesses you cannot treat yourself, then your GP should be your next port of call. Your GP should be your first point of contact for non-emergency illnesses you can’t treat yourself. Your GP is available from 8.00am to 6.30pm weekdays. If you don’t have a GP, you can register with your local surgery. If you’re not sure where this is, you can find out at: www.nhs.uk or call 0300 77 77 007. If your local surgery is closed, you can still see a GP with the GP out-of-hours service; just call 111 and you can speak to a local GP over the phone or face to face if necessary. It is very likely that you and your family will be seen and treated more quickly using the out-of-hours service than if you were waiting to see a doctor in A&E, especially at busy times. Litherland Walk in Centre is open 8am – 8pm every day. in Litherland Town Hall, Hatton Hill Rd, L21 9JN. Call 0151 475 4667. No matter where you live in Sefton you can simply drop in – there is no need for an appointment and all ages can get treatment here. The service treats minor illnesses and injuries that do not need a visit to accident and emergency (A&E). Remember A&E is for serious and life threatening illnesses or injuries. Manage your repeat prescriptions and make GP appointments from the comfort of your own home, without having to venture outside, by using the new FREE Patient Access website and smartphone app. Simply search for ‘Patient Access’ in the app store. Remember though, if using Patient Access for the very first time, you will first have to contact your GP practice so that you can register to use the app. For information about services that can help in south Sefton over the bank holiday please visit our ‘Your Services Health page’. Residents and visitors still have time to have their say on Sefton’s Council’s updated Equality and Diversity Policy. The refreshed Equality and Diversity Policy 2016 – 2020 helps set out Sefton’s approach to making sure all staff are equipped with the relevant knowledge and skills to meet the diverse needs of the borough. Cllr Trish Hardy, Sefton Council’s Cabinet Member for Communities and Housing, said: “This is a very important policy and we encourage as many people as possible to take part in our consultation. “The policy sets out our approach to equality and diversity for the next three years and shows how we meet the requirements of the Equality Act 2010. Those wishing to have a say on the policy have until June 29 to make their views known. A draft copy of the refreshed policy is available to view online via http://www.engagespace.co.uk/sefton or by calling 0151 934 3202. Come along and meet Sefton Council’s newly formed ‘Green Sefton’ team who will be taking to the borough on June 8 to support World Oceans Day. Green Sefton brings together Coast & Countryside, Parks & Greenspaces, Flooding & Coastal Erosion, Risk Management and Grounds Maintenance teams all together to ensure a joined up approach to the vital management, development and oversight of Sefton’s beautiful coastline, parks and green spaces for years to come. Join Sefton’s Lesbian, Gay and Bisexual (LGB) network Embrace at the next monthly social evening in Bootle on Thursday 31st May 2018. The evening takes place at Kindfulness Coffee Club on Knowsley Road in Bootle from 7pm until 8.30pm, and will be an opportunity for local residents to find out more about the Embrace network, meet new people, and access support and advice related to LGBT issues. Sefton Council for Voluntary Service (CVS) has been awarded the NHS 70 community partner of the year award, as voted for by staff of NHS South Sefton Clinical Commissioning Group (CCG) and NHS Southport and Formby CCG. Be Active is back for May half term! Be Active is preparing to keep Sefton’s youngest residents entertained this May half term with a fun-filled line-up of activities set to take place from Tuesday, May 29th to Friday, June 1st. A huge range of activities will take place at leisure centres across the borough including Bootle Leisure Centre, Crosby Leisure Centre, Crosby Lakeside Adventure Centre, Dunes Splash World, Litherland Sports Park, Netherton Activity Centre and Maghull Meadows Leisure Centre. The hugely successful Wave Rave pool parties are set to make a return along with a wide array of pool-based activities including swim and splash sessions, inflatable parties and the preschool swim crash course. Those looking to try something new can make the most of the water sports on offer at Crosby Lakeside Adventure Centre during its Lakeside Adventure sessions. For those looking to stay dry over half term, Be Active’s May-hem days will include obstacle courses, adventure games, tournaments, dodgeball and maybe even a bouncy castle! The ever popular Everton Soccer School will return to Netherton Activity Centre and Football Camp will launch at Dunes Splash World in Southport. Sefton’s sportiest youngsters can also try their hand at gymnastics, fencing and archery thanks to Be Active’s Come and Try classes. Fans of The Greatest Showman will love the dance workshops that are lined up with the opportunity to learn new, choreographed dance routines from the hit musical. “There is such an array of activities happening across Sefton that our youngest residents will be spoilt for choice this half term. For the full line up of activities head to www.sefton.gov.uk/beactive. Places are limited and advanced booking is required so call 0151 288 6286 or 0151 934 4799 to secure a place. Alzheimer’s Society – Sefton, has organised two events to coincide with Dementia Action Week (formerly Dementia Awareness Week). The first is a pop-up Memory Café and Dementia Friends session at the: Kindfulness Café, Knowsley Road in Bootle on May 22. Click here to see the poster for the session. A second event is a Dementia awareness talk and services showcase at Lord Street West United Church in Southport on May 23. Click here to see the poster for the event. Alzheimer’s Society Sefton want people to become more dementia aware and find out about the services they provide in Sefton so, whether you currently live with dementia or want to find out more about this condition, these events are for you. There are so many myths and misunderstandings about dementia and it is often portrayed very negatively. Alzheimer’s Society Sefton can inform you of the facts rather than the fiction and explain that it is possible to live well with dementia. Everyone has a role to play in identifying and treating sepsis in its early stages. That is the message from local health commissioners who are backing a campaign to raise awareness of the illness. Sepsis is a potentially life threatening condition which can lead to multiple organ failure and death if not identified and treated early. It is estimated that around 150,000 people a year in the UK are diagnosed with sepsis which can be treated with antibiotics if identified in its early stages. NHS South Sefton Clinical Commissioning Group (CCG) and NHS Southport and Formby CCG are backing a campaign by Health Education England titled ‘Think Sepsis’ which is raising awareness of the illness. Local health commissioners are highlighting a different element of sepsis diagnosis and treatment every month between now and world sepsis day on September 13. This month, the Sefton CCGs have focussed on medicines management and the role community pharmacists can play in offering support to anyone who may have concerns about the illness. Speaking about the campaign, Susanne Lynch, head of medicines management at the CCGs, said: “Everyone has a role to play in identifying and treating sepsis, including community pharmacists. Although it would be very rare for someone to present themselves at a chemists with signs of sepsis, we need everyone to be vigilant and ensure they familiarise themselves with the symptoms and are able to respond accordingly. People are advised to seek medical advice urgently if you’ve recently had an infection or injury and you have had possible early signs of sepsis. People should be aware of the following symptoms which may indicate a person has sepsis. Residents across Sefton are being encouraged to feel the benefits of being more active by trying a free beginners course in bowls. Taking part can give yourself a boost, feel more refreshed and is a great way to meet new people. ‘Bowl for Health’ is an eight week programme designed for complete newcomers to bowls, providing an overview of the basics and how to play a match. Run by qualified and welcoming coaches, the programme is available in Waterloo, Formby and Southport. The programme is being led by MSP and Active Sefton, thanks to funding from the Big Lottery Fund. The idea was developed and successfully piloted in 2017 by Holy Trinity Bowling Club in Formby, and is now being rolled out by more clubs across the borough. Sessions are starting up in May and June in Waterloo (Brooke Hotel Bowling Club), Formby (Holy Trinity Bowling Club) and Southport (Victoria Park Bowling Club and Southport Bowling Club) – completely free for any Sefton residents who would like to improve their physical health and wellbeing, with all equipment provided. Helen Birrell from, Sefton Council, said, “Bowl for Health is great way to increase your activity levels and enjoy the outdoors. We are delighted to be able to support the project to enable Sefton residents to lead an active lifestyle”. For further information about the programme or to book your free place then please visit www.merseysidesport.com/bowlforhealth or call MSP on 0151 728 1811.